Mighty No. 9 is a Japanese 2D Side-scrolling Action gamethat takes the best elements from 8 and 16-bit classics thatyou know and love and transforms them with modern tech, fresh mechanics, and fan input into something fresh and amazing. You play as Beck, the 9th in a line of powerful robots, and the only one not infected by a mysterious computer virus that has caused mechanized creatures the world over to go berserk. Run, jump, blast, and transform your way through twelve stages using weapons and abilities stolen from your enemies to take down your fellow Mighty Number robots and confront the final evil that threatens the planet. Every aspect of Mighty No. 9s development art, level design, music, programming, etc. is being handled byveteran Japanese game creators with extensive experience in the genre, all the way up to and including the projects leader,Keiji Inafune himself. Classic 2D Action: Transformed. Face off against your 8 Mighty brethren and unlock new transformations as you defeat them, granting you unique skills and abilities. Play through 12 Challenging Stages in a single player campaign that will put both your thumbs and action platforming skills to the test. New Game+ with unlockable two additional difficulty levels for those who want an even Mightier challenge. Single Player Challenge mode with dozens of mini missions to fully test your skills. Boss Rush Mode: Play through each of the games bosses, back to back, with a clock ticking to keep track of your best time, so you can share, compare, and show off your skills to your friends. Show the world your Mightiness in the 2 Player Online Race Battle where you compete online, racing through each stage together in a head to head battle - adding an all new twist on versus mode play that will give Mighty No. 9 life well beyond the single-player campaign. 2 Player Online Co-Op Challenge Mode: take on over a dozen missions online with a friend, playing as Beck and his partner, Call!Use Beck and Calls different powers together in order to defeat these special challenges. Leaderboards + Rankings: Use Becks Absorption Dash skill and his other abilities + transformations to chain together combos and perfect your run-throughs to earn those sweet high scores and S-Ranks. 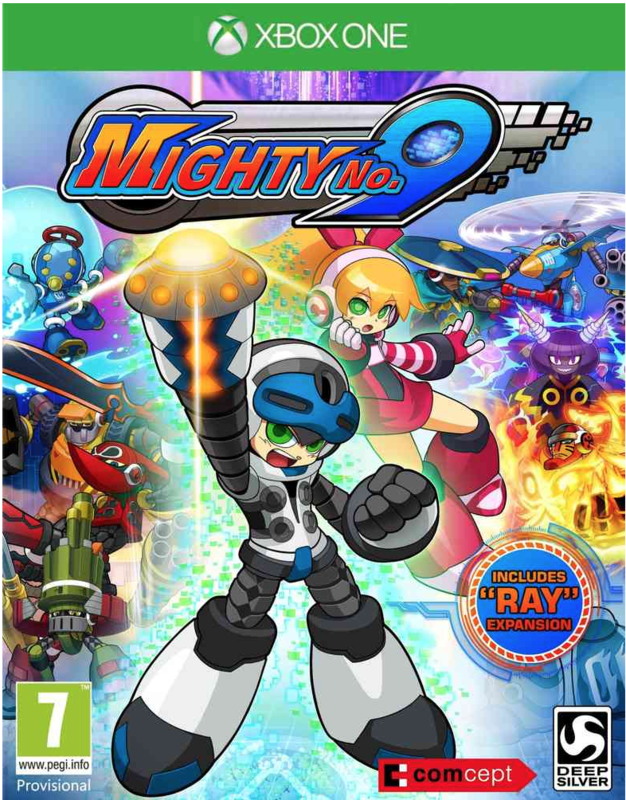 Mighty No.9 is a veritable whos who of veteran game composers (Manami Matsumae, Takeshi Tateishi, Ippo Yamada), so we thought, why not tap into that retro vibe? Mighty No. 9 features an optional chiptune version of the entire game soundtrack which you can toggle on and off.